Humans have long had a love affair with cuddly bears. Think Winnie the Pooh, Baloo from The Jungle Book, and everyone’s wise-cracking favorite, Yogi! Well, there’s a new bear in town who is set to become the latest favorite. His name is Bear (of course! ), and he is huge, furry, and simply adorable. Yes, Bear has some real problems. He’s afraid of the sound that breathing makes and asks Molly to hold her breath while she sleeps. He’s terrified of babies that say, “Goo!” He’s afraid of flash bulbs, dogs barking, and, oddly, being mugged while he sits in a La-Z-Boy recliner. He’s afraid to jump in water, he’s afraid to get water in his eyes, and he’s afraid to . . . well, you get the idea. And in addition to all those fears, Bear also happens to suffer from allergies. That’s right, he’s allergic—to his own fur! Bob Scott’s prose is sweet and funny and spot on. 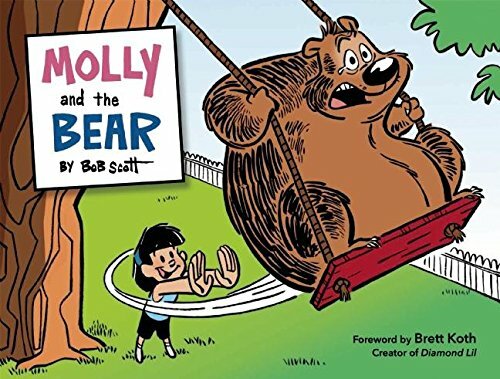 In fact, it’s easy to see that he has given his all to this collection of comic strips, that by completing this unforgettable volume of “Bear-ism’s,” he has shared his dreamed with his readers and left them smiling, fired up, and ready for more humor. And that’s one thing we surely can’t get enough of: smiling, soothing humor.